When network outages interrupt access to remote IT infrastructure, the SRM-100 Secure Rack Modem provides an ideal solution for safe dial-up, out-of-band communication. The SRM-100 features state of the art security and authentication to ensure that even when primary network communication is unavailable, administrators and tech support staff can still securely access remote network elements via a reliable dial-up connection. In addition to providing a secure, dial-up solution for out-of-band communication, the SRM-100 also includes a 10/100/1000Base-T Ethernet Port, allowing the SRM-100 to serve as a network accessible, shared modem for users who lack access to modem communication. 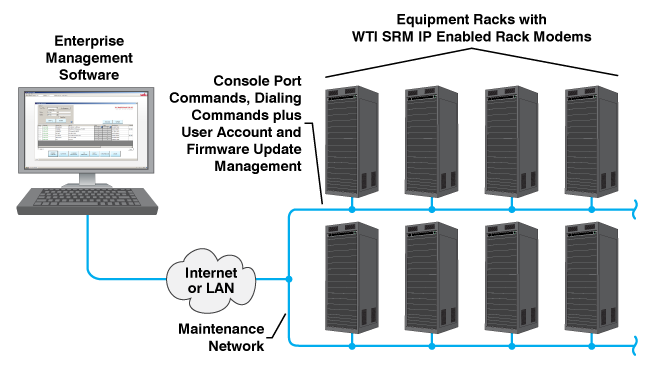 The presence of an Ethernet port also allows network access to SRM configuration and management functions, plus provides support for reverse/outbound SSH/Telnet, enabling users to easily establish secure connections with other devices on your network. Dial-up access to the SRM-100 is protected by a user directory that allows administrators to set individual passwords, callback numbers and access levels for up to 128 user accounts, plus a call-back security function to verify the identity of each dial-up user. Network access to the SRM-100 is protected by authentication protocols such as LDAP, TACACS+, Kerberos and RADIUS, plus security features such as HTTPS/SSL, IP Address filtering and a FIPS 140-2 cryptographic module. The SRM-100 Secure Rack Modem, available in both AC and DC powered models, provides a network-accessible, rack-mountable solution for dial-up out-of-band communication with advanced security and authentication features, plus the ability to establish reverse SSH sessions. If your current dial-up, out-of-band access solution consists of a series of consumer-grade external modems, shoe-horned into gaps in your equipment rack, the SRM-100 can provide you with a more reliable, convenient and secure approach to dial-up communication. Make installation easy with a simple 19" form factor that conveniently fits into your equipment racks and cabinets. No more random modems sitting loosely on top of your router just waiting to fall. The SRM comes in a space saving 1u footprint designed for stability and functionality. The SRM-100 AC Secure Rack Modem provides password-protected, dial-up access to rack mounted serial communications equipment. The SRM's non-volatile memory can store up to 128 user accounts, each with an optional dial back number. The Dial Back number can then be used by the SRM to verify the identity of each logon by automatically dialing the callback number for the account before allowing access to the connected device. Each user account can be assigned an individual password, user name, access privileges, and an optional Dial Back number. Access privileges assigned to each account determine which SRM-100 command functions the account will be allowed to employ. This allows administrator level accounts to gain access to command mode functions in order to change parameters or check user activity, while barring non-administrator accounts from command mode functions and other SRM capabilities. The SRM-100 includes three data logs that can be used to track user activity, alarm events and temperature readings and log this data for future review. User activity is recorded in the Audit Log, which lists a description of each event, the name of the user account involved and the login/logout status of each account. Alarm activity is tracked by the Alarm Log, which lists the name of the alarm function that was triggered and indicates whether or not the alarm was later cleared. Temperature readings are recorded in the Temperature Log, which can be displayed as either straight data or in graph format. Records in all three of these logs are time and date stamped to simplify the process of interpreting data and detecting trends or suspect activity. All configuration tasks are performed via the SRM-100 command mode. The command mode is used to select configuration parameters, create user accounts and review unit activity and event logs. The command mode can be accessed locally via the serial RJ45 or USB Mini format Console Port, or remotely via dial-up connection or Ethernet. The SRM-100 features two convenient command mode interfaces: a Web Browser format interface for access via Ethernet, plus a traditional command line interface. As mentioned previously, the access privileges set for each user account can be employed to determine which users are allowed to access command mode functions and which users are restricted to basic dialing functions. In addition to allowing secure dial-up access, the SRM-100 can also provide outbound/reverse SSH sessions to devices on your remote LAN. This means that when Ethernet access to remote networks is unavailable, administrators can then dial-in to the SRM-100 unit over PSTN and create an outbound SSH connection to any troubled device accessible over the remote Ethernet wired LAN. The SRM-100 AC is built in the USA and backed by our famous 5x5 5-year warranty. WTI products are installed in thousands of network sites world wide. Our customers know they can depend on WTI for superior quality and reliability for their most mission-critical operations. All SRM products include WTI’s convenient Enterprise Management Software, which drastically simplifies the task of managing multiple modems deployed throughout your network infrastructure. The WMU Enterprise Management Software provides a centralized command interface that allows administrators to easily manage, label and control multiple WTI modems in large network applications, reducing the time required to access your mission critical equipment. Once installed on your PC or laptop, the Enterprise Management Software can search a user-defined IP address range on your network and discover all WTI modems within the range. Discovered units are then added to the Enterprise Management Software’s inventory, allowing administrators to assign a descriptive tag to each modem in order to denote the location or function of the device. In addition to providing a centralized interface for remote modem access, the Enterprise Management Software can also be used to control firmware updates for WTI products and edit and manage user accounts at individual or multiple WTI modems. Voltage: 100 - 240 VAC, 50/60 Hz, 0.2 Amp Max.